Far 615 km. from Bangkok and 54 km. from Udonthani. Nongkhai is where Highway 2 (Also known as Mittaphap Highway, Friendship Highway and Asia 12) ends, at the Thai-Lao Friendship Bridge over the Maekhong River (Internation river). Across the river is the Lao People's Democratic Republic. Nongkhai is only 24 km. from Vientiane opposite Tha-Dua on the other side at Ampher Sri-Chiangmai. 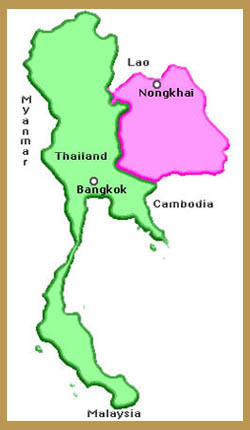 Nongkhai has 13 Aumphers and 4 Semi-Aumphers (we called "Ging-aumpher"), estimated 7,332.3 square km. And has an average elevation of 365 m.
This is the first international bridge spanning the Mekong. 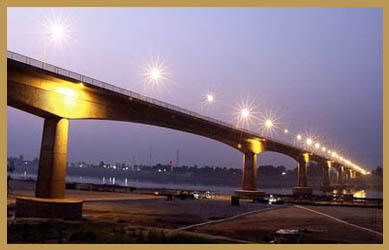 The bridge links Nong Khai with Vientiane and was built jointly by the governments of Australia, Thailand and Laos. The bridge was opened in April 8, 1994.